We cruised with Princess some five years ago, and loved it. Food was amazing, service exemplary and cabins comfortable. We were excited about this cruise around the Far East. Oh dear. Embarkation was in Singapore. Fairly efficient if your a sheep.... One holding pen to another, and eventually we got on board. Obviously straight to the buffet. There we were met by a long line waiting to get in. 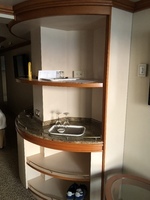 Princess has now installed two wash hand basins in the entrance and a crew member instructed all passengers to wash their hands. (Apparently the alcohol sanitizer wasn’t effective against norovirus.) Can you imagine how long it takes two thousand people to wash their hands using four sinks? The cabin next. (Superior balcony) Superficially clean enough, but dust was everywhere. They have installed two large TV, but have left the old fitted cabinets as a complete waste of space. The table on the balcony was rusty then simply painted over..... 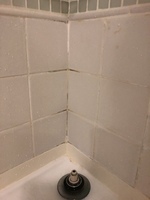 The tiles in the bathroom was very worn and looked blue moulded. That led to the best experience on board. Guest services. I took photographs down and they agreed it looked terrible. They were covered over with new grout the next day. (Semi successfully) They then phoned to officially apologise and add a $250 credit to our shipboard account. This is customer services and in all my dealings with them they were all efficient, polite and a pleasure to deal with. That is a real credit to the company. To dinner. What a disappointment. Much less choice, tiny portions, and a reliance on fish and shell food. It was the worst MDR menu in all the twelve cruises we have taken. Four nights we ate in the buffet as none of us four travelling could find anything desirable. The international cafe. This is open 24/7 for snacks that are complimentary, but charge you $1.35 for a coffee?? Please. This ship was updated in 2018. This seem to amount to new, and very stylish carpets. This ship still looked it fifteen years old. It was superficially clean but when I retrieved my cruise card from the side of the sofa it was filthy. Dusty, With worn, damaged and stained seating. A fitted cabinet with no purpose other than to hold the fridge, and waste space. 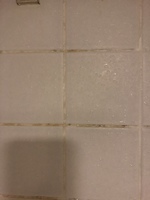 Dirty worn tiles. Rusty but painted over furniture. The new TV system was excellent with a great choice of films. The bed was supremely comfortable.